The battle at Koufu Castle has been lost, the Furies are no longer restrained by daylight, and while the individual members of the Shinsengumi still survive, the links that bound them together have been torn and shattered. 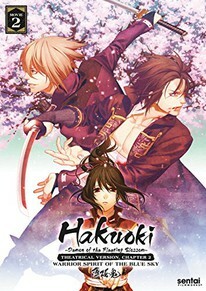 As Harada, Shinpachi, and Saito try to fight their way out of Koufu, Chizuru holds true to her oath to Hijikata, standing guard over Kondou, while he and Okita fight to recover from their gunshot wounds. And Hijikata faces the greatest test of all. Having partaken of the Water Of Life, he must now balance his humanity against a need for blood and the deeds the Fury's power makes possible. Is saving the lives of those he cares about worth the ultimate sacrifice? Because no matter how skilled they are, no matter how brave, not everyone will survive the epic conclusion of the Hakuoki saga. Swords flash, heroes die and the fires of war ignite in the thrilling second motion picture of Hakuoki Warrior Spirit of the Blue Sky!